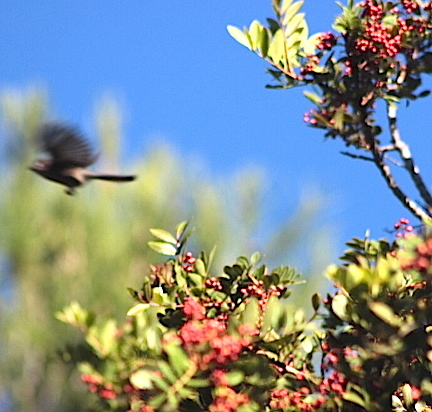 Practicing my photog skills, trying to capture a tiny little finch near our Brazilian pepper tree. Not too happy with the results, but I’m a student, not a master. Fllighty finches. Dozens of these tiny birds converge on one tree, stay for a minute, and move on to another one. It’s nearly impossible to snap a pic while they chirp the happiest of songs. This entry was posted in All Posts, Animals:Defend/Protect, Photography and tagged Bird, Bird photos, Brazilian pepper tree, Finch, Photography, photos, Studying photography by Enchanted Seashells by Princess Rosebud. Bookmark the permalink. Yes, exactly! My photog teach taught me to snap the pic just BEFORE and that’s how I captured this guy. Don’t wait, trust the camera to take the pic in that split second. Now you try! When I did it last summer there was a bird feeder. Good tip and will remember to snap right before. This time of year not many birds around due to the cold! Yes, after a zillion tries and I never gave up! Good for you, for persevering! Those birds are so darn cute, and faaaaaast!